Now, how many of you have had Macaroni and Cheese SOUP!? Not many of you? Me neither, until the other day. And, it was marvelous. So marvelous that I can’t wait to make it again. And again. And again… you get the picture. This creation comes from Lori Lange, the RecipeGirl. She recently sent me a copy of her new cookbook, The RecipeGirl Cookbook, which is just as fantastic as her blog. It includes some recipes from her website, yet most of them are new for the book. These recipes range from very easy to a little more involved, but everything is completely do-able by your average home cook. The ending pages include entertaining tips and themed menus that I’m particularly very excited about. I’ve already made a couple of recipes from Lori’s book and blog that have pleased not only my palate, but also my husband’s and toddler’s. 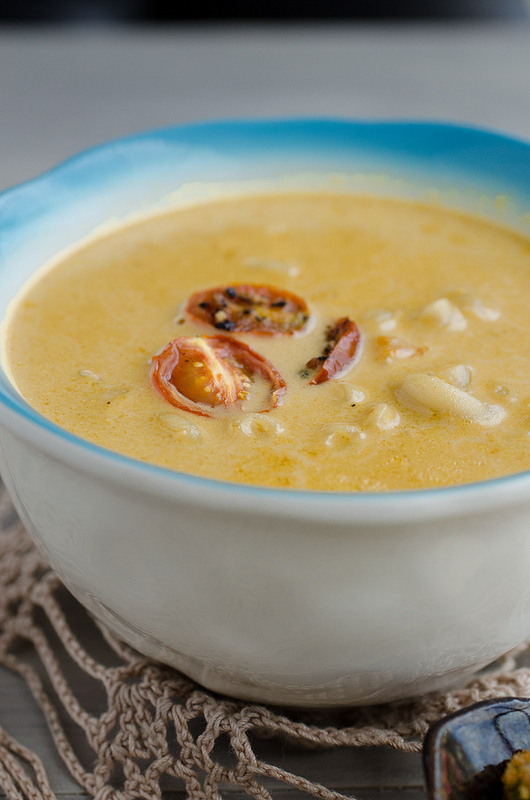 This Macaroni and Cheese Soup, though, has to be one of our favorites. I love that it’s completely homemade, easy to make, and is kicked up a notch from your typical cheesy pasta dish by injecting Dijon mustard and hot sauce. The roasted tomatoes are a clever addition, as we all know how well cheese and tomatoes go together. It was hard for me not to pop each tomato in my mouth before the soup was done! While I was cooking the macaroni, I saw an avocado on my counter that needed to be used up. So, I sliced it up, rolled the slices in some spiced Panko crumbs, and then lightly fried them to create “dippers” for the soup. They made a great accompaniment that I think you’d like, too, so I added it to the recipe. 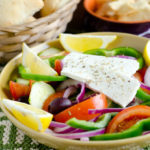 Visit RecipeGirl.com and then come back and leave a comment here telling me which recipe on her site stands out to you most! That’s it! Giveaway closes on Saturday, June 1st at 10:00PM EST. One winner will be chosen randomly and announced at the top of this post. Winner will also be notified by email, so make sure you leave a valid email address in the appropriate field. Disclosure: This contest is sponsored by yours truly. 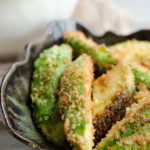 Lightly fried avocado slices to accompany your Macaroni and Cheese Soup or serve with your favorite dip. Double, triple or quadruple the recipe to create a fun appetizer! Heat the oil in a medium skillet. Combine the bread crumbs, mustard and salt in a pie plate or shallow dish. Slice and peel the avocado into sturdy strips. Dip each strip into the seasoned bread crumbs, then lightly fry in the skillet. 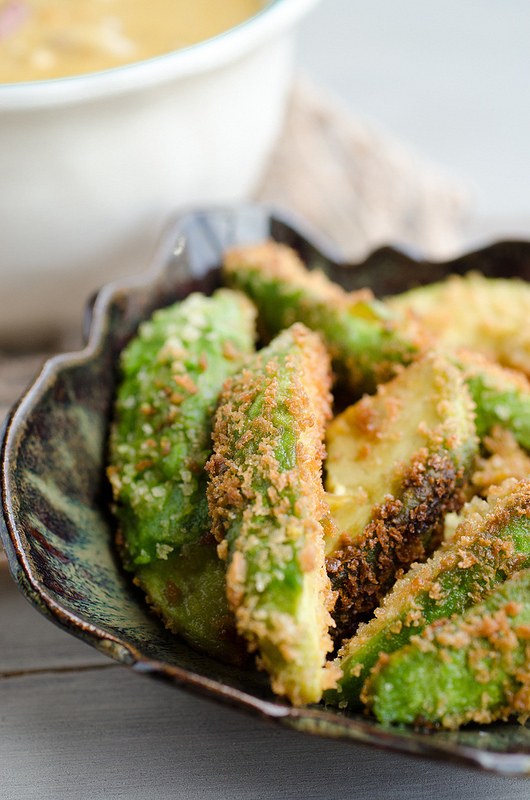 Work in 2-3 batches, and make sure to flip every 30 seconds or so to fry each side of the avocado slice. Transfer to a paper towel lined plate to drain and cool. Serve with Macaroni and Cheese Soup, or with any favorite dip. the lobster roll looks great! I loved the Bacon, Avacado, corn salad. 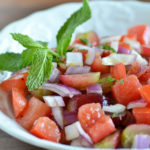 With summer around the corner and BBQ’s to go to what and easy and delicious side dish to take along! Love that recipe girl!! I love her blog and subscribe to it for amazing recipes. Her gourmet salad was a recent recipe i definitely want to make!! Funny thing about this recipe is that when I was younger my mom accidentally added to much milk to the mac and cheese once and ended up with soup. It wasn’t all that good but this looks great! As for a recipe I want to make, I’ve been eyeing her meyer lemon cheesecake cake. oooh I love the Roasted Vegetable and Black Bean Tacos!! I might make them tonight! http://www.recipegirl.com/2013/01/26/2-ingredient-pancakes/ a try, looks so easy, healthy, and yummy! The bacon and corn griddle cakes look amazing! 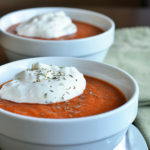 I visited TheRecipeGirl’s blog and I browsed her vegan recipes. The one that stood out to me, and I really want to try it, was the Roasted Chickpea Dip with Toasted Cumin and Pomegranate seeds. Yummy! Hmmm…either her manicotti or easy gourmet salad. Yummy! Looks delish! I love her Asian chicken with brown sugar (can’t remember the exact recipe title) – we love it on the grill. Her lemon-oregano salmon with roasted tomatoes looks absolutely delicious! I went right to Lori’s grilled recipes, because we grill a LOT in Tampa and I’m always looking for new ways with chicken, our go-to protein for the grill. I chose Cilantro Chicken, because it’s simple and easy, and the combination of cilantro and sweet chile sauce was just too good to resist. Thanks for introducing me to RecipeGirl! How to pick just one? The candy bar cookie bars look amazing. The South Carolina BBQ Pork Sliders look great! Being from MS, I’m always looking for a quick, easy BBQ recipe!! Her amish pumpkin cinnamon rolls w/ caramel icing look amazing!!! The barbecued shrimp with remoulade sauce looks amazing! I always use Lori’s brownie recipe, easy and moist it’s killer!! Her Oreo and caramel stuffed chocolate chip cookie bars! Bake and slice chocolate swirls! I am so excited about all of her kid-friendly recipes! How do I choose only one stand-out recipe? I’m very excited about the croissant chicken! I think my family will love it! Her Baked Pumpkin Doughnuts look awesome. making plenty in the future! I picked Roasted Butternut Squash Soup w/ Apples and Garam Masala though. Many don’t know the wonders of Garam Masala and adding it to this recipe sounds Devine! 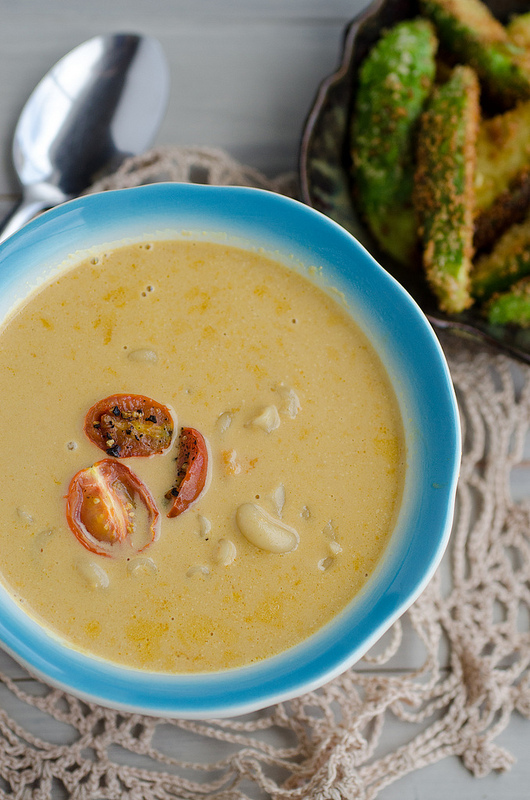 Rainy, cool day here… Going to be a toss up between making this one and your Mac & Cheese Soup!! Think tomorrow is another cool, rainy one. I may just be in luck! I want to try the lobster roll! Tex Mex Blackeyed Pea Casserole, I love peas! I love her cheesecake cakes. I made the Red Velvet Cheesecake Cake at Christmastime last year–big hit! Thanks so much. Think I will make your soup tonight! I will make her Slow Cooker Tex Mex Chicken & Beans tomorrow! Ham and Swiss Griddle Cakes or the Garden Vegetable Quiche. The stuffed zucchini boats look really good. I am loving the idea of the Chicken and Spinach Enchiladas! I visit Lori’s blog often, and recently made her Margarita cake for my niece’s 21st birthday party! It was a BIG hit, and will be one that I make again!! I would LOVE to have her cookbook! Thanks Nikki!! Everything looks delicious but I went to the kid friendly category as our oldest is so darn picky and I’m trying to find new things that we all can enjoy and that she will actually eat. Think I found one……….Baked Lemon Chicken Spaghetti Primavera. I have been looking for a good Beef Stroganoff recipe and the one by the Recipe girl looks great! This looks fabulous! looking forward to seeing you next week! Are you bringing the whole family?! Hey Tina! YES! Family will be with me. Can’t wait to see you! It is hard to pick just one! The balsamic mango marinated grilled chicken sounds great! The Alfajores look delicious and my Latin husband would like me to learn how to make them. Thanks for the chance to win. More than one stood out for me but I have got to try the crockpot rootbeer pulled pork. That must taste heavenly. Lemon and garlic pan fried ribeye steak! Yum! This time of year, I’m most tempted by ice cream, her blueberry cheesecake ice cream looks delicious! Blueberry lime pound cake– yum! Oh man, I need to try her recipe for Asaparagus Risotto! I SO wanna try her choc chip cookie dough topped brownies! Apricot- Balsamic Chicken! I love cooking and glazing with jams and preserves, and what’s not to love about balsamic. I like the black and white pound cake. . The Creamy Gruyere & Shrimp Pasta sounds great. The strawberry cheesecake cake looks amazing! Root Beer Pulled Pork sounds awesome to me! 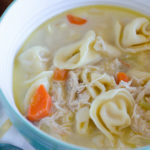 Wow this soup looks crazy delicious 🙂 what a smart recipe! Twisting my arm to pick just ONE! (Big Smile) Looking forward to the Apricot Balsamic Chicken. (Making Grocery List Right NOW!) Will also stock up for the Macaron and Cheese Soup! The bruschetta with peach salsa and melted Brie sounds delicious! The apple cider doughnuts look incredible! Hello,I am so excited about all of her kid-friendly recipes! How do I choose only one stand-out recipe? I’m very excited about the croissant chicken! I think my family will love it!